Six months ago, the MediaFire team set out with a clear vision: to create the best online storage and file sharing service in the world. Today, we are bringing that vision to life with the beta launch of MediaFire Desktop, a free application for OSX and Windows that enables users to instantly upload, collaborate, and share their media in the cloud. Available today for free, MediaFire Desktop includes one of our most requested features: automatic file syncing. Designed to make uploading, sharing, and managing files a breeze, MediaFire Desktop comes with the storage you need to share and store all of your digital stuff (up to 50 gigs for free) and the flexibility to accommodate even the largest of data users. Paid plans start at 25 dollars a year for 100 gigs of storage: which is around half the cost of other online storage services. MediaFire Desktop has been designed from the ground up to let you do more with your Media. From automatic web-based audio and video transcoding, to viewing your files on the go through your mobile device, MediaFire provides you with all of the online storage that you need for around half of the cost of other online storage services. 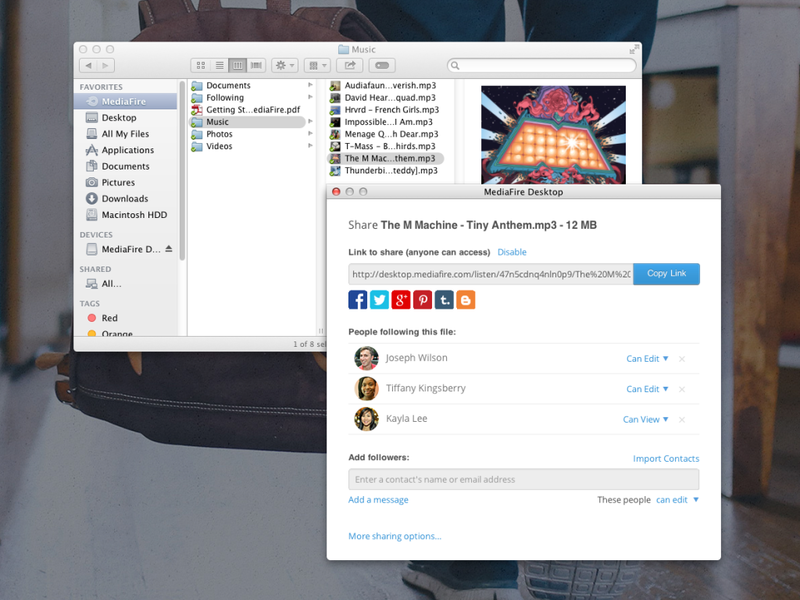 Instantly Share files directly from your desktop via Facebook, Gmail, and Twitter: Use MediaFire Desktop’s Contact Management Screen to instantly share files with your contacts on Facebook, Gmail, and Twitter. Sharing Permissions: Permission-based sharing allows you to control the level of access that your contacts have to specific files and folders. This feature is great for teams and small businesses! Following Tools: MediaFire Desktop lets you follow shared files from other Desktop users, enabling you to instantly add, copy, and download files from others. Advanced monitoring tools let you track downloads and access, and notification let you know instantly when files are changed or modified. SSL Everywhere: SSL access has been extended to all of the core MediaFire systems including downloads and text editing. Automatic Audio & Video Transcoding: Download audio and video in the perfect optimized format for your device, instantly. Files can also be streamed at multiple resolutions in real-time, with over 200 supported viewable file formats available at launch. -Thanks so much for being part of the MediaFire family!